Morten Anderson - What's cooking in ASP.NET vNext? 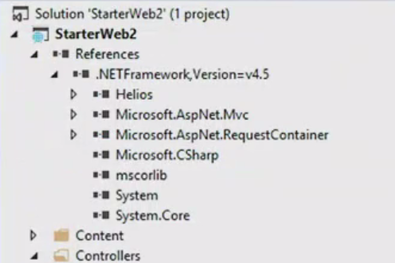 If you ever worked in an ASP.NET application you most likely know System.Web. It has so much functionality we use all the time when developing in ASP.NET. But all that functionality comes at a price. System.Web is one of the biggest dll's in the framework and leaves quite the footprint when loading your app. In ASP.NET vNext Microsoft has split up the functions from System.Web which means that we can pick whatever we need for our specific application leaving a much smaller footprint. It's not all good news though. Webforms are not getting rid of System.Web. Webforms had too many dependencies to System.Web and it was not possible for Microsoft to part the two. Using NuGet to reference dll's has been part of our world for a few years now and most .NET developers are used to using NuGet in daily development. Going forward we will not be referencing dll's in Visual Studio but NuGet packages instead. If we wish to we can even get Roslyn to compile dll's to memory and avoid dll's on disk altogether. I apologize for the poor quality of the image. It's taken from the first of the three videos above. Unfortunately the Visual Studio tooling for ASP.NET vNext is not ready for the public yet so this is the only screenshot available. Lots of other new things than the two I have mentioned here are included in ASP.NET vNext. Some are listed below. MVC and Web API are merged together since much functionality overlapped. Possible to ship CLR with your application meaning that you no longer need to wait for the IT-department to update to a new .Net framework. Possible to run different versions of CLR side by side on server. If you want a taste of the new ASP.NET you can go to ASP.NET vNext to get the source code and the how to on running the bits. Visual studio tooling is expected to be ready in June.